Human body consists of complex systems, one of which is excretory system. Excretory system removes waste of metabolism from our body. Some metabolisms happen in human body, such as food and drink processing. Metabolism produces waste that should be released from our body because it is poisonous to the body, e.g. urine and carbon dioxide. The excretion process is done by a system which is so-called excretory system. What organs include in excretory system? How do the organs involved in excretory system work? The organs that are included in this system are kidney, lungs, skin, and liver. 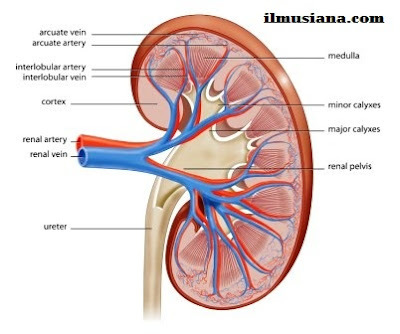 Kidney is located in distal abdomen cavity. The function of kidney is to filter unusable substances (waste) in blood. This waste will be excreted along with urine. There are three parts of kidney, the outer partion of kidney is called pevis. Cortex is composed of Malphigian tubules and capillaries. Medulla is composed of contortus tubule and capillaries. Pelvis is like a chamber that is used to reserve urine for a while, and then the urine flows into urinary bladder through ureter. In the cortex, there are blood filters that are called nephrons. They are composed of millions of Malphigian tubules. Each Malphigian tubule is composed of glomerulus and Bowman capsule. In this Malphigian tubule, filtration of blood occurs. Filtration permits fluid and small solute dissolved in the blood plasma, such as sodium, glucose and urea, to pass through and become part of the filtrate. The big solute, such as blood cells and protein cannot pass this filter. Filtrate which is produced by filtration in glomerulus then enters Bowman capsule cavity. This filtrate is called glomerulus filtrate of primary urine. Primary urine will flow through contortus tubule. In the early proximal contortus tubule, needed substance in the filtrate is reabsorbed. It forms secondary urine or tubules filtrate. After the secondary urine reaches distal contortus tubule, it will undergo an addition of add unneeded substances (secretion) and water absorption (augmentation). This process forms the real urine. Urine will pass through ureter from kidney to the urinary bladder. Then, it will pass through urethra and be released from the body. In the body, food (glucose) is changed into energy through a process called cellular respiration or biological oxidation. Besides producing energy, this process also produces waste, e. g. carbon dioxide and water vapor. The waste is excreted from the body through the lung. Carbon dioxide and water are excreted from the body’s cell and enter the circulatory system that takes it to the heart and than to the lung. Finally, it enters the capillaries which surround alveoli. Alveoli are small bubbles in lung cavity. Blood in the capillaries contains more carbon dioxide than that in the alveoli cavity. As the result, capillary’s carbon dioxide will diffuse through the capillary wall and alveoli wall and then go to the alveoli cavity. Carbon dioxide will diffuse if the capillary and alveoli cell walls are wet. 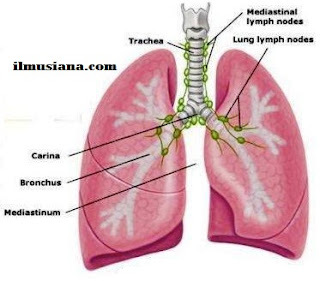 Finally, carbon dioxide and water are excreted from the body through bronchus, trachea and nose. Skin is a thin layer that covers our body’s surface. The functions of skin are protecting our body from environmental disturbance, such as friction with hard things, too strong light, diseases, heat and chemical substance, water and fast storage, touching sense and place where vitamin D is formed under the sunshine. Skin also functions are excretory organ which releases sweat as body waste. 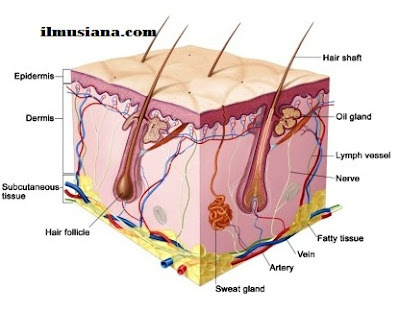 Skin is composed of three layers: epidermis, dermis, and subcutaneous tissue. Liquid waste will be released from the body not only through kidney as urine and lung as water vapor, but also through skin as sweat. Sweat glands are spread out throughout human skin. They have long arterial from; their lower end is rolled in the dermis, whereas their tips lengthen out of the skin surface. These rolling lower ends of sweat gland connect to capillaries. Water as metabolism waste in the capillaries is absorbed into the sweat glands. Then, the sweat will pass through out the body to the skin surface so that our skin will be wet by the sweat. Along with the water absorption from capillaries to sweat gland, there is also absorption of salt solution (especially table salt or NaCl) and urea. The objective of releasing sweat is to keep human body’s temperature constant. When it is very hot, the skin will release sweat. The high temperature of the air will be used of evaporating the sweat, so it will not burn the skin. Over sweat evaporation due to hot temperature or hard work will reduce body’s fluid and salt, so it will make them imbalance. Over evaporation of sweat can be balanced by drinking much water to prevent the body from dehydration and mineral lost. 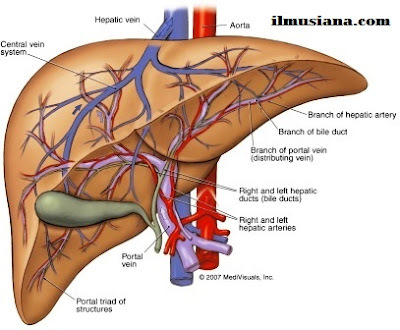 Liver has many functions, such as the glycogen (glucose form in liver) storage, place where protein is synthesized and degraded, toxic neutralizer, blood cells degradation and as excretory organ. As an excretory organ liver excretes bile liquid (the product of erythrocyte degradation) and urea (the product of protein degradation). Old erythrocyte will be changed in the liver. Hemoglobin, which is consisted in erythrocyte, will be separated into iron (Fe), globulin and heme. Iron will be sent back to spinal marrow to make to make some new hemoglobin. Globulin will be reused to make some new hemoglobin. Heme will be separated to be bile dyes and bile salt that are called bilirubin and biliverdin. Bile dyes in the bile liquid will flow into small intestine. Bile salt will be used to degrade fat (lipid), whereas bile dye will be released in the feces and urine. Bile dye make feces and urine have yellowish color. If there is disturbance that inhibits bile liquid will enter the blood and make the blood has yellowish color and the feces has grayish brown color. Protein in the food will be broken into amino acid. Amino acid will be synthesized as protein. Amino acid and protein that cannot be synthesized will be changed as energy or fat. Amino acid changed into energy and fat will result waste containing nitrogen which belongs to amine. In liver, amine is combined with carbon dioxide to form urea. Then, urea will be excreted through the kidney in form urine.